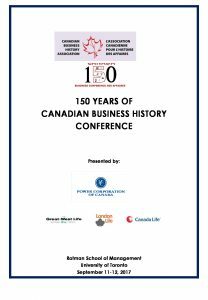 The 2017 Conference celebrated Canada’s Sesquicentennial Year with the theme 150 Years of Canadian Business History. This conference has its own dedicated website, which contains complete information and digital presentations of all Keynote and Session presentations. The website can be viewed HERE. Co-Presenters: Historica Canada; Canada’s History Society; Michael Lee Chin Family Institute for Corporate Citizenship; Oral History Centre, University of Winnipeg; Department of History, University of Toronto; Economics Department, University of Toronto; Bill Graham Centre for Contemporary International History – Trinity College, University of Toronto. Synopsis: A national 2-day conference to highlight 150 Years of Canadian Business, presented in conjunction with Canada’s Sesquicentennial birthday celebrations. The conference is multi-disciplinary and open to participation by academics, business leaders, professional archivists and the public. The conference will present a range of session topics on business sectors that have played an important role in shaping the Canadian economy since Confederation. Keynote dinner and luncheon speakers will be presented by high-profile experts and will address broad issues on several topics. An edited book will be published and include selected papers presented at the conference. A permanent digital archive of the conference and the book publication will be maintained with free public access.